What better way to spend the holidays than with a play that will have you rolling in the aisles. 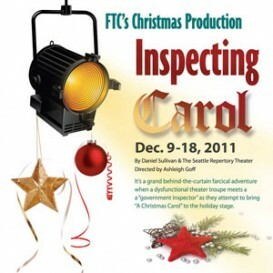 It’s Christmas time and a small theater is preparing to bring “A Christmas Carol” to its holiday stage. At auditions, in walks an unknown actor who is mistaken for an informer for the National Endowment of the Arts. The troupe is put into high, farcical gear as they bend over backwards to accommodate the bewildered wannabe actor who is given a role in the holiday production. Everything that can go wrong goes wrong, hilarity is piled upon hilarity, and the Christmas holiday will never be seen the same way again by this struggling troupe – nor by our audience! Perfect anytime, this is a special family treat at Christmas. Please call the box office (888-669-7114) for information on group pricing. Visit www.fredericksburgtheater.org for tickets.